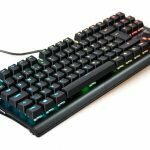 The SteelSeries M750 is a solid mechanical keyboard with an aluminum top frame that makes it lightweight and unable to flex. 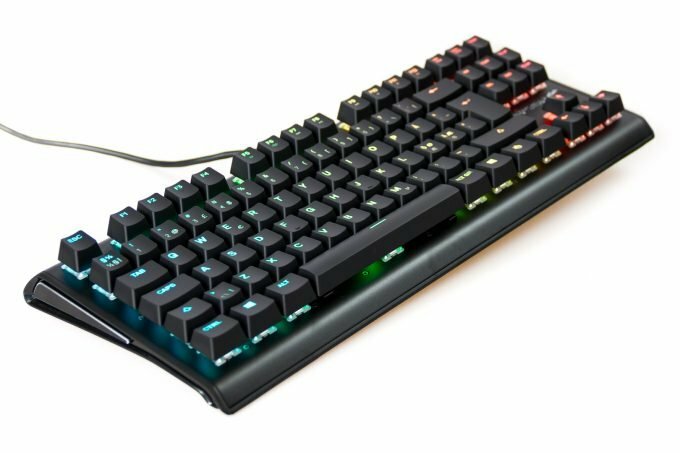 It features QX2 switches that are almost identical to Cherry MX Red switches but feels slightly more responsive and a tiny bit louder. Also, the switches have a different placement of the LED light, so the keyboards RBG illumination is brighter MX Red keyboards. Overall the keyboard offers the best gaming performance on the market with excellent built quality and switches. The only minor downside is the non-removable USB cable. 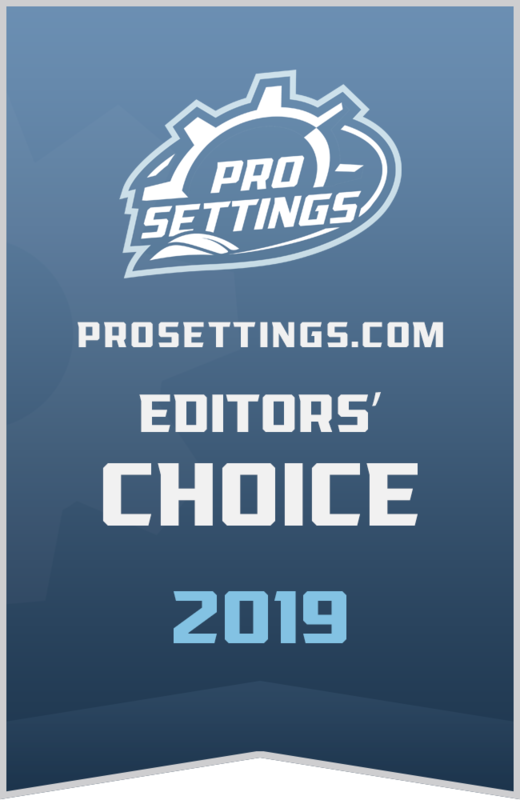 Giving excellent gaming performance and superb built quality, the SteelSeries M750 TKL received our Editor’s Choice award. 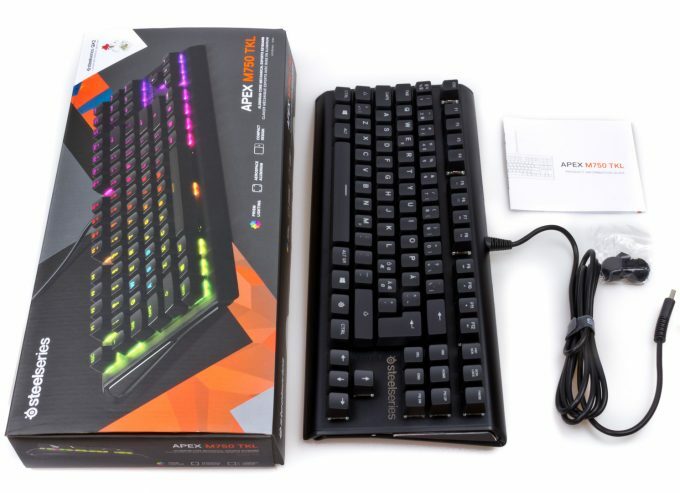 The SteelSeries APEX M750 TKL comes in a neat package including the keyboard and a manual. 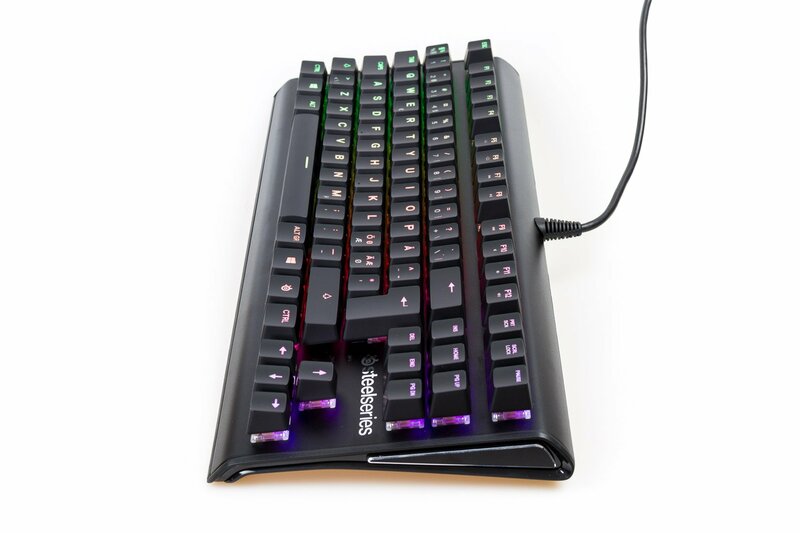 The keyboard looks stunning with its aluminum frame and impressive RBG lightning. 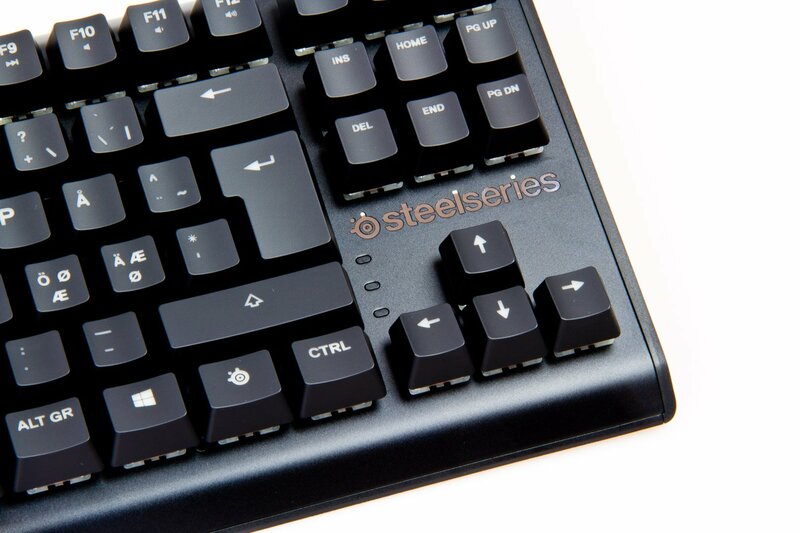 The SteelSeries M750 is a solid keyboard, featuring a 5000-series aluminum frame (5000 series aluminum are alloyed with magnesium, which offers good corrosion resistance and therefore often used in marine applications). The solid aluminum frame makes it not only beautiful to look at but also impossible to flex and surprisingly lightweight. 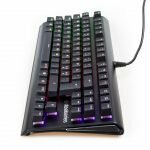 The model we tested was the Tenkeyless version, or TKL, which means it is without the numeric keypad, giving you more space on your desk. It is possible to get the keyboard with the numeric keypad, but unless you use it, we would recommend picking the TKL version and getting a bigger mousepad instead. As you can see from the side, the keyboard has a slight upward slope in its natural position. 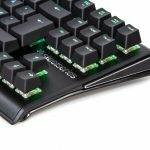 This is something to consider if you like your keyboards completely flat. For me, it was not a problem and I usually slope my keyboards anyway. Overall, I would describe the keyboard as very minimalistic and I really like the design of it. 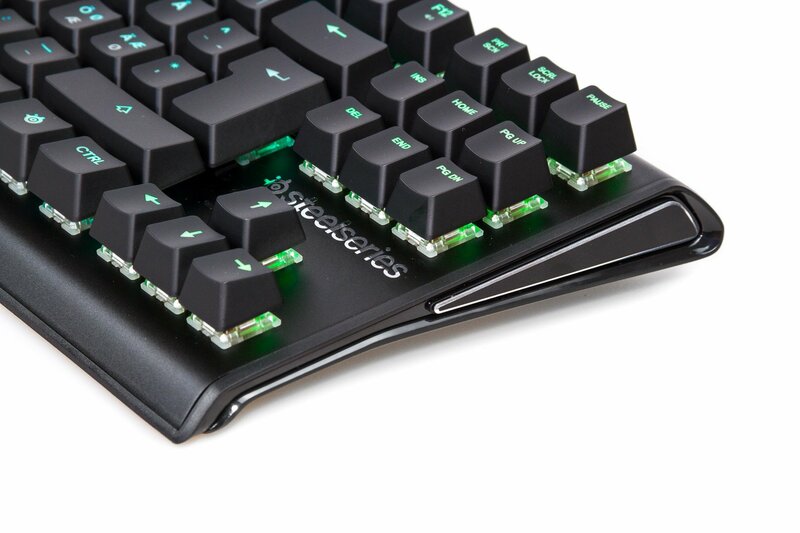 As you can see from the picture, the keycaps slightly float above the keyboard. The USB cable on the keyboard is non-removable which is a little bit disappointing as if something happens to the cable it is not possible to replace it. 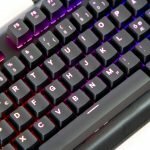 Keyboard switches are probably the most important feature of a mechanical gaming keyboard, so let us get into details about the QX2 linear switches. 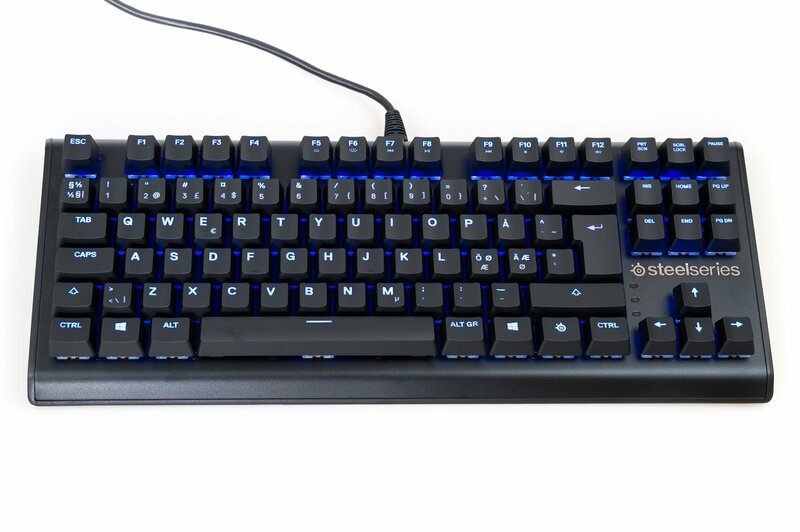 The M750 keyboard was the first keyboard to feature SteelSeries QX2 linear switches. 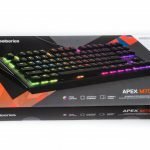 The switches are developed in partnership with Gateron, which is a Chinese company with a good reputation for making switches for gaming keyboards. 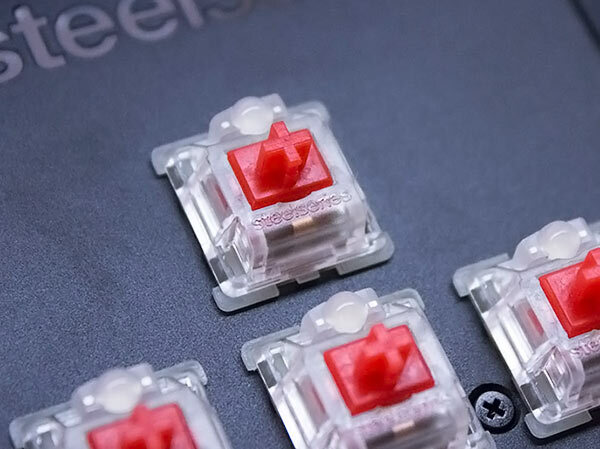 Essentially, the switches is a modified version of the Gateron Red switches, and are very similar to the Cherry MX Red switches which SteelSeries has previously used in their mechanical keyboards. The difference is primarily in the housing of the switch. The LED light of each switch is placed above the switch on top of the housing. 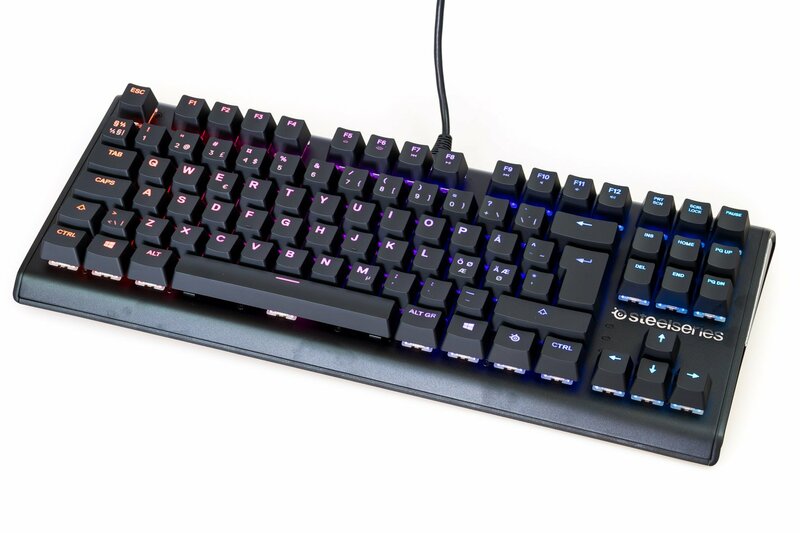 The LED placement makes the RGB lightning much brighter than on standard Cherry MX Red switches, so if you are a big RGB fan, this is definitely a big plus. 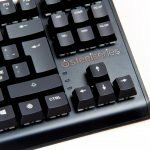 The stems in the SteelSeries QX2 switches are compatible with the Cherry MX stem, which means you can use any Cherry MX keycaps with the SteelSeries QX2 switches. 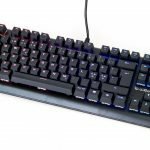 The Cherry MX Red is probably the most famous and well-regarded for PC gaming, so it is no surprise that the QX2 switches provide similar performance. 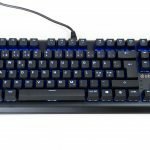 Having both a keyboard with the Cherry MX Red switches and QX2 Switches, it is really hard to tell any difference when using them – they feel very much the same. However, there is a tiny difference, but it is hard to tell what exactly feels different and which one is best. I am pretty sure most people would be very comfortable with both the MX Red and QX2 for gaming. The QX2 feels a tiny bit lighter to press down, so you could argue that they are slightly more “responsive” in their feel, but again it is a small difference. They are also a tiny bit louder, but if you are concerned about noise from your keyboard, I would recommend buying some O-rings. 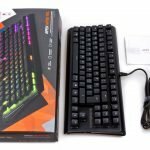 Overall, nothing to put on performance, the keyboard has absolutely excellent performance and the keyboard is fantastic to play on. Besides the excellent performance, the keyboard is compatible with the SteelSeries Engine 3 software. From the software, everything can be customized. 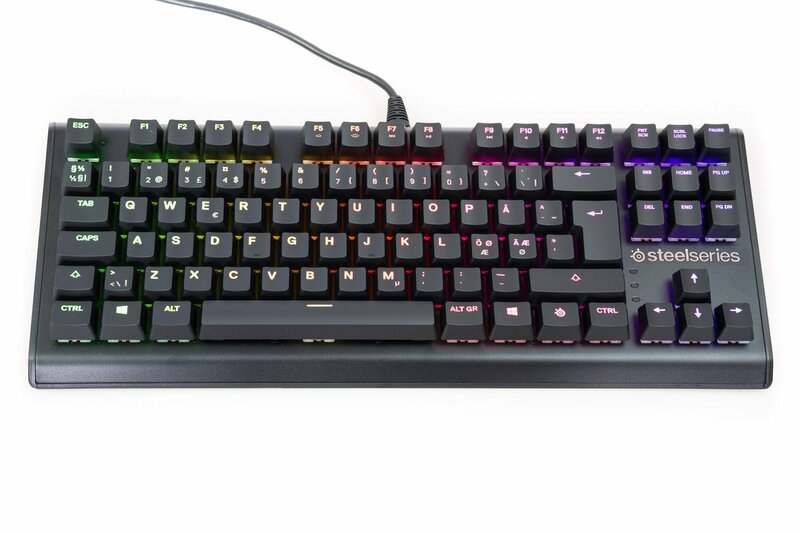 The polling rate, the brightness of the RGB, the RBG colors, keyboard layout, keybindings, and many other things. The software has a built-in macro editor where you can record and assign macros for each key. 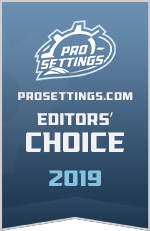 Overall, the SteelSeries software is very easy to use. 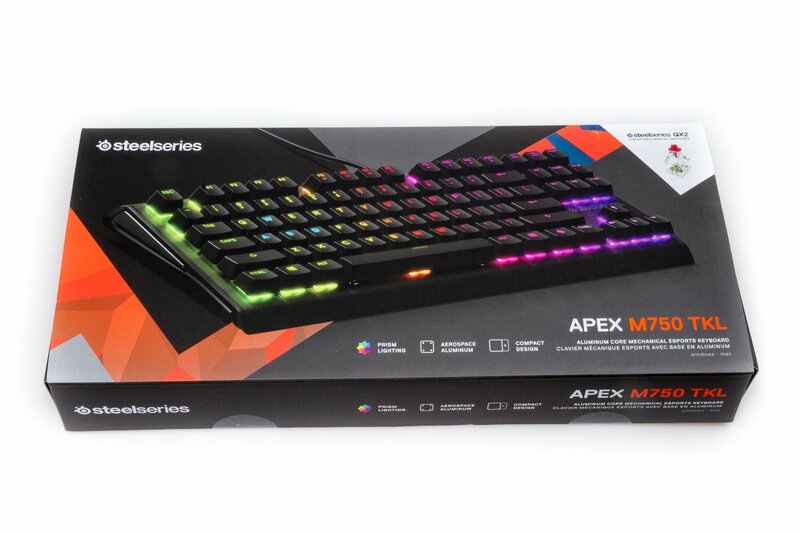 The SteelSeries APEX M750 is a solid keyboard with a durable 5000-series aluminum frame which makes it stunning to look at, impossible to flex and very lightweight. Design wise the only downside is the USB cable which cannot be detached. 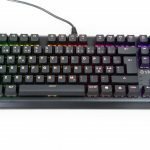 The keyboard features QX2 switches which is very similar to Cherry MX Red switches, but feels slightly more responsive and is a tiny bit louder. The switches are some of the best when it comes to gaming performance and feels really good to play on. 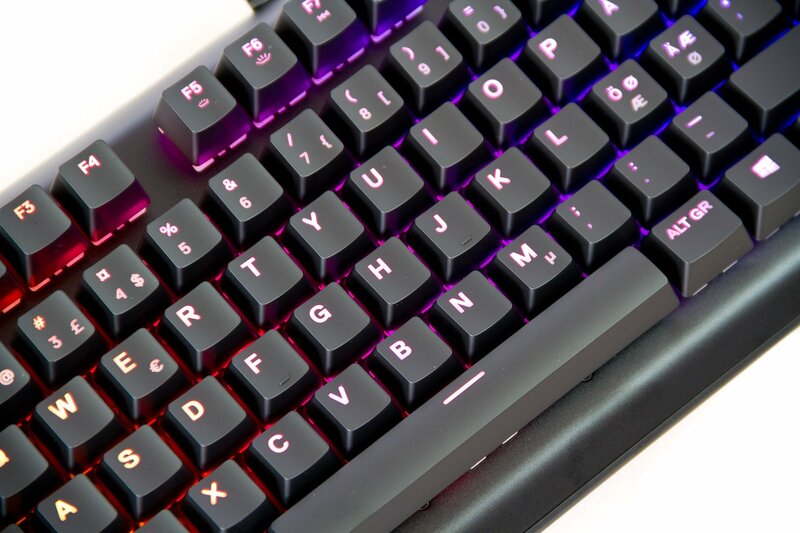 The LED light is placed above the switch on top of the housing, making it one of the brightest keyboards we have tested. Overall the keyboard looks great, feels great and performs great.